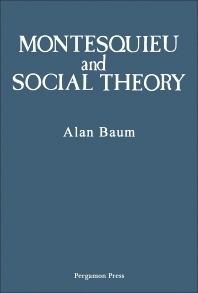 Montesquieu and Social Theory details Montesquieu’s contribution to sociology. The title chronicles Montesquieu’s work that led to establishing the fundamentals and principles of sociology. The text first details Montesquieu’s biographical account, and then proceeds to discussing the Montesquieu’s motivation in his works. The next chapters encompass Montesquieu’s works, which include Persian Letter; Considerations on the Causes of the Greatness of the Romans and their Decline; and (On) The Spirit of the Laws. The last chapter details Montesquieu's influence in the late 18th and early 19th centuries. The book will be of great interest to anyone who has a keen interest in the development of social science.